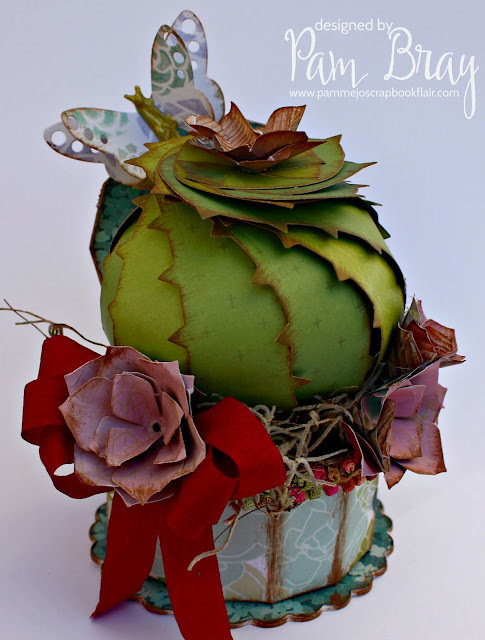 Begin by distressing pattern paper with a distress tool. Cut the Life And stamp apart from the Simple Phrase Set Stamp. 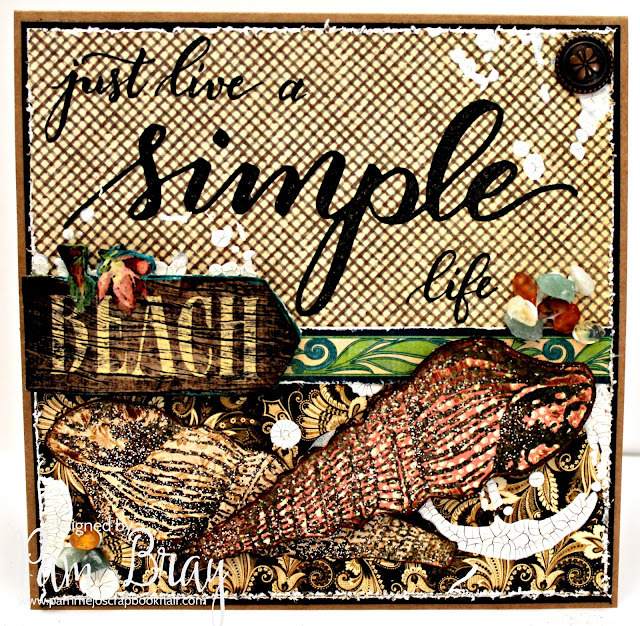 Stamp "Just Live A Simple Life" from the Simple Phrase Set Stamp using black ink. Adhere to front of 5 1/2" x 5 1/2" square card front. Stamp Cerith Stamp using VersaMark on pattern paper. 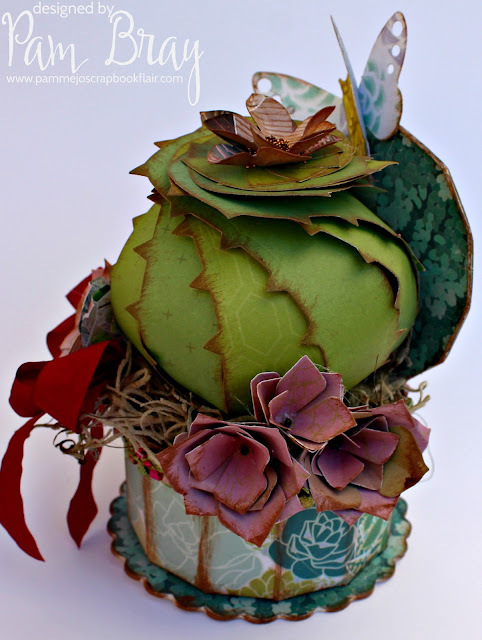 Apply Weathered Wood and Moss Stone Green Embossing Powder. Fussy cut embossed Cerith stamped image out. Ink edges with Vintage Photo Distress Ink. Add Cerith Seashells to top of card front with pop dots. Fussy cut Beach from pattern paper; add to front of card front with pop dots. and Metal Flower Crest Brad to front of card. I hope you have been inspired to go to the seashore, look at a few books about the sea or maybe watch a movie to get your creative Surf and Turf ideas ready to create with us. Begin by first embossing the background from the Grunge Background Stamps Set using VersaMark and White Embossing Powder. Ink tag with distress ink using a blending tool. 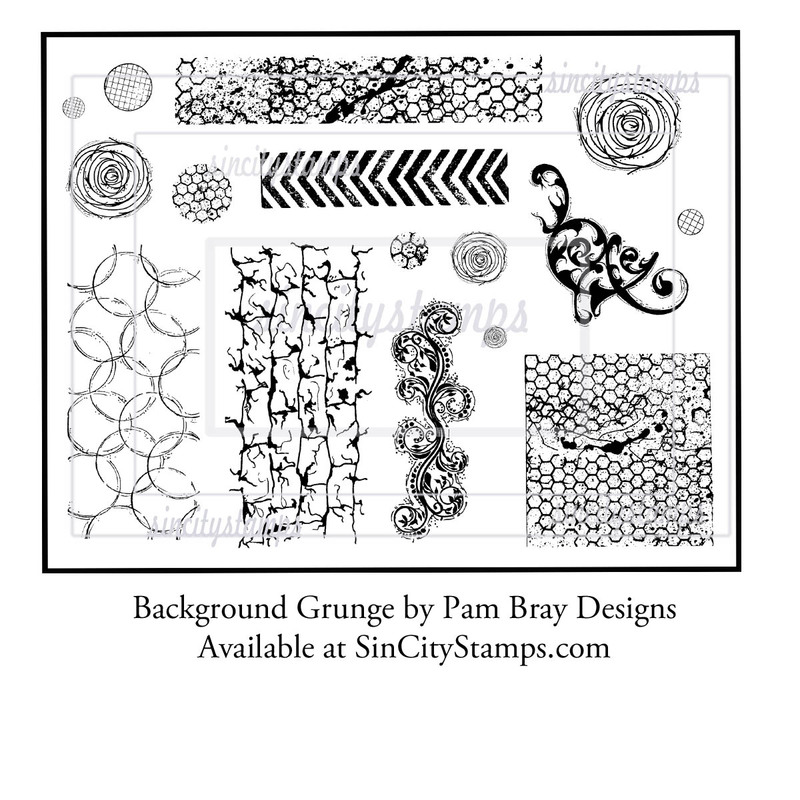 The Grunge Background Stamps are available at Sin City Stamp as a pre-order. Stamp backgrounds from the Grunge Background Stamps Set with black ink. Adhere chipboard to top of tag. 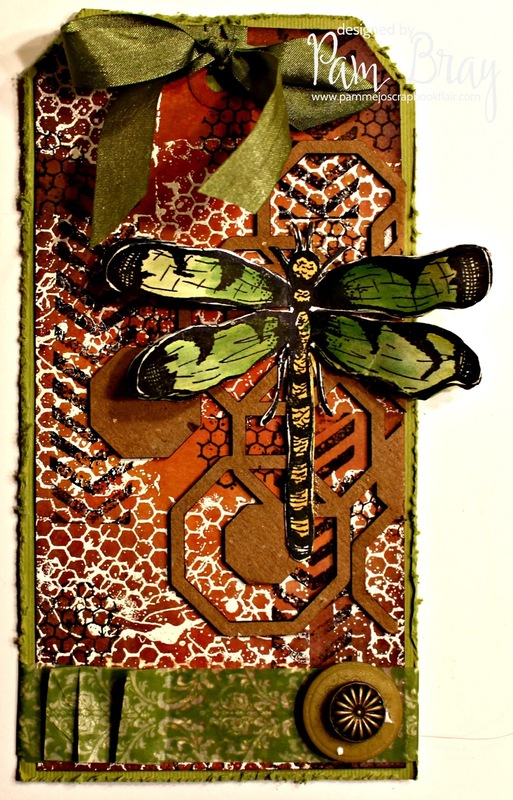 Stamp dragonflies on white card stock; paint with distress ink. Layer dragonflies together at bodies. Bend wings up to make it look like they are flying. Adhere tag to top of green card stock; distress edges with distress tool. Add washi tape to top of tag along with button and metal brad. Add bow to top of tag. I am super excited to share my first project using my Grunge Background Stamp Set from Sin City Stamps! 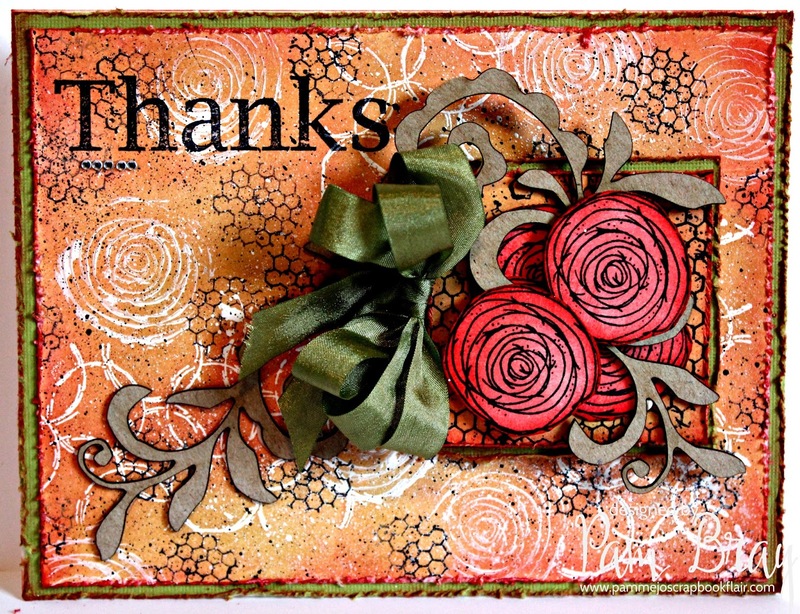 What better way to begin but with a Thanks Mixed Media Card!!! Begin by first stamping the circle background to white card stock with VersaMark; emboss with embossing powder. Apply distress inks to top of prepared card stock with blending tool. Stamp rose image with white paint; dry. Stamp honeycomb image with black ink. Spatter with white and black paint; dry. Distress prepared background paper with distress tool. Adhere to top of distress green card stock. 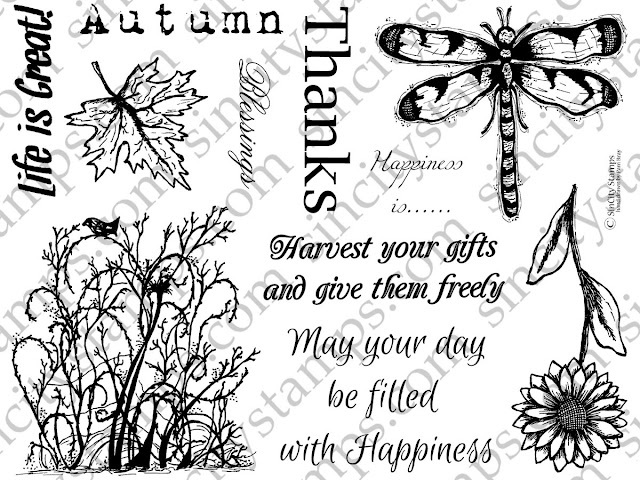 Stamp "Thanks" from the Fall Stamp Set. ; add gemstones. Stamp honeycomb and roses to white card stock. Distress and mat prepared honeycomb piece to card stock. Fussy cut roses out and place on honeycomb mat piece; add two to top with pop dots. Add chipboard pieces to top of card front. Add bow to front of card front.